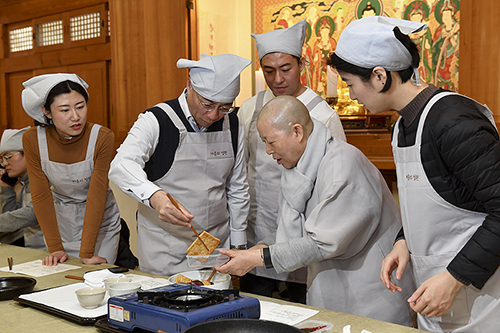 The interest in the temple cuisine, one of the best known cultural features of the Korean Buddhism, is ever increasing. 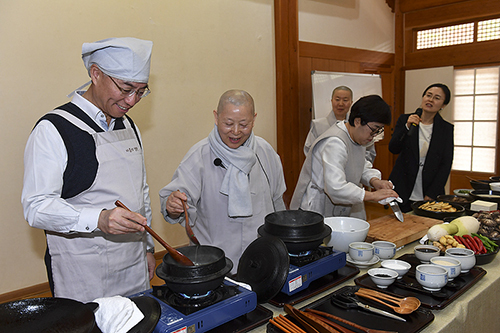 Ambassador Qiu Guohong and 10 of his staff from the Chinese Embassy visited Jingyon-sa Temple on March 20 to experience Korean Buddhist culture in general and learn how to cook temple food in particular. 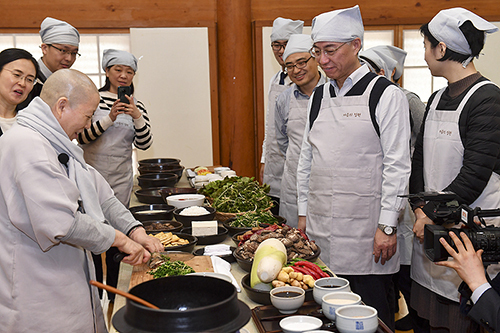 Venerable Gyeho welcomed them in Hamwol-dang Pavilion to guide them through the world of temple cuisine. 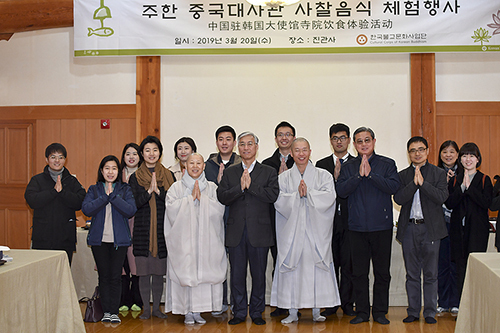 The event was co-hosted by the Department of Social Affairs of the Jogye Order of Korean Buddhism and Cultural Corps of Korean Buddhism to introduce the diplomats stationed in Seoul to the Korean Buddhist temple culture. So far, the staff and their family from Sri Lankan, Nepalese, the US and Indian Embassies have been participated in such events. Then she taught the Chinese guests how to make shepherd’s purse porridge, tofu glazed in soy sauce, tofu pickle, and lettuce pancake. Lettuce pancake was specially chosen for the day’s menu, given the Chinese people’s propensity for fried dishes. In fact, it was the lettuce pancake Ven. Gyeho introduced when she appeared on one of Chinese TV networks. A spring fare particularly favored by the Korean monastics practicing Seon Buddhism, the shepherd’s purse porridge captured the attention of the Chinese Embassy staff with its unique fragrance. Ambassador Qiu was helping Ven. Gyeho, amazed how its smell intensified as the porridge was simmering away. Ven. Gyeho instructed even the stirring of the simmering porridge should be done with a due attention, and the stirring be done uniformly and only in one direction, saying calm focus and sincere good wishes while cooking will ensure the food will not only taste good but also restore the health of those who partake it. Ambassador Qiu replied that he likes to cook so he would go home and serve the family what he learned on that say, saying he would make sure he would pour good wishes into his porridge, though he had not given much thought to it before. Picture 2) Ambassador Qiu Guohong is serving the tofu glazed in soy sauce he prepared. The Chinese embassy staff couldn’t stop eating the food made and served by Ven. Gyeho, for they said the food tasted that good. Ambassador Qiu complemented the tofu glazed in soy sauce in Korean, saying “Mat-it-ne-yo.” Mr. Feng Minyu, who has worked as the third secretary of the Chinese embassy for four years praised the food he had at Jingyon-sa, saying the tofu pickle he made himself, which was packed to be taken home with him said it would be a welcome gift to his family over the dinner back home. 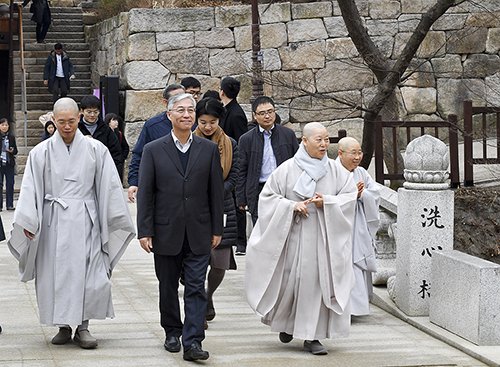 Venerable Wongyeong, the director of Cultural Corps of Korean Buddhism thanked the Chinese Embassy for visiting Jingyon-sa Temple, and wished the templestay experiences they had, especially of the temple food and tea would in some way enrich their life.